… you’ve got a brand new key. This update title made more sense before I turned it into Lanternpalooza but I was too lazy to come up with another name. DC Comics – Tomar-Re/Tomar-Tu and Medpyhl have new sprites based on a new sprite template pose I made. 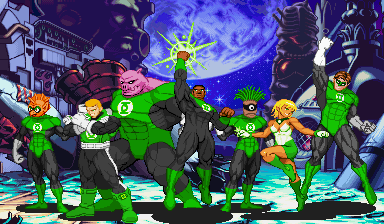 Kilowog, John Stewart and Arisia sprite edits added. Some of the separate Wonder Woman sprites from the old version of the gallery have now returned. Custom Sprite Downloads: Laslunder has made a GIGANTIC update to his pack of edited Cody base sprites. Huge, I’m telling you! The Skate sprite was done now because someone made a request. I usually don’t sprite requests but this was a special case. The Skate sprite was added to my Illmosis site earlier this week. There’s even a work progress animation on it’s gallery page. Check that out with this link. Now check out Wizzy’s original theme for Max Thunder with a sprite by Armentis! PSN Sale reminder: Bionic Commando: Rearmed for PS3 is on sale for $4.99 and the sequel is on sale for $9.99. I fully recommend checking out the first one but I haven’t played the second. Also, The second has that unfortunate DRM that won’t let you play the game if you aren’t hooked up to the internet. Buying Final Fight: Double Impact right before the Playstation Network went down which meant I barely had a chance to play it. The first Rearmed game doesn’t have it so go get it now! Just a minor update here. The Manuke/Rocky sprite has been improved (check out the gallery page on Illmosis). Sayo-Chan’s sprite edits have been improved with a pants-wearing version and better colors (thanks to Shin Otaru for suggesting that). You’ll also find a Miki/Becky alternate palette for Sayo in the generators, a feature that I forgot to add last week. Yes, that’s why there was a palette option choice for Sayo last week with just one option. The Punisher-era Nick Fury sprite had a mis-colored pixel in his right hand so I fixed that while also tinkering a bit with the palettes to improve the contrast. 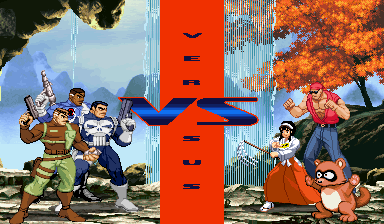 I also threw in a few more background & Vs. graphic options for the “Custom Scene (384×224 pixels)” set-up in the Vs. Maker including Guile’s SFII stage, Avengers HQ, KoF 98’s China stage and more. 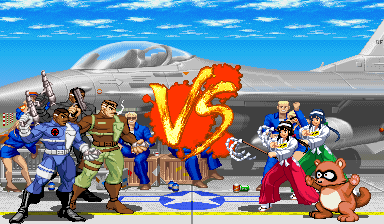 Custom Sprite Pack Downloads – Laslunder added more sprites to his pack of SFA3 Cody (Jeans and shirt) edit pack. He has my thanks for letting ScrollBoss be one of the places where you can find it! Game List – I hadn’t updated it since October of last year. Games added include 3D Dot Game Heroes, inFamous, Moon Diver & Wipeout HD for the PS3 along with Beatdown for PS2. Yes, inFamous & Wipeout HD were my PSN Welcome Back choices and I’ve been playing a lot of inFamous. Brawlers who remember that this post’s title is also the first line in one of Capcom’s greatest beat-em-ups already know which two Marvel heroes are in this update. Fans who know the Japanese names of an excellent but lesser known Taito series may have figured out who else is in here. Anyone kind enough to check out Illmosis earlier this week already know which multiplayer gaming icon came to the party with enough explosions for everybody. I also have a ScrollBoss account set up on Tumblr! Check it out right here. There will be more than just update posts there so keep an eye on it if you have a Tumblr account. Comments Off on Sayo prayers!